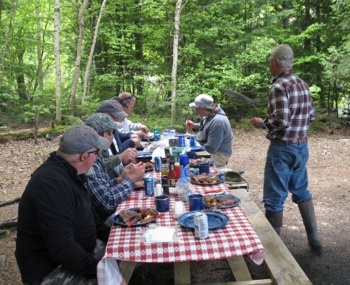 Make your adventure at our Maine lake cabin rentals complete with an exciting outdoor guided trip. All of guides have many years of experience on our waters. They have extensive knowledge in fishing, wildlife and the great outdoors. This is a real opportunity for our guests to "step back in time" and experience for a day what our area is really all about and enjoy a great day on the water. Our guides routinely visit more than 35 lakes in our area and each lake has its own beauty and fishing opportunities. Whether you are into the "numbers" game or are looking for that trophy you have always wanted, our guides will try to fill your day with memories that you can take back with you. Let us prepare a shore side lunch cooked over an open fire for you on a chosen lake for the day. Steak, kabobs, ham, chicken, hamburgers, and even lobster are some of the many choices you can have. Potatoes, onions, chowders, and some of your catch, rounds out the meal. Plus do not forget the camp coffee and the desserts, and a few surprises along the way. 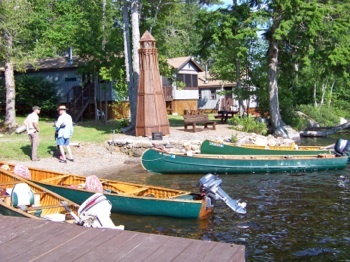 Each guide can take two people in a Grand Laker Canoe powered by a 10 hp or larger outboard motor. Most of the canoes can exceed 15 mph and reach fishing areas not suitable for other boats. So sit back and relax and let us do the work!! The "Ford group" at shore lunch.